BROOKVILLE builds and refurbishes commuter and freight locomotives, such as the Eagle Commuter engines, as well as modern and heritage streetcars, including the off-wire Liberty Modern series. BROOKVILLE’s diverse, customisable product line provides short line and regional railroads with eco-conscious freight rail solutions, and transit operators with innovative vehicles designed to navigate the infrastructure and environmental challenges of US cities. BROOKVILLE Liberty Modern streetcars integrate the latest technologies in rail-transit into a modern solution to deliver innovative vehicles. Available in two body widths, the Liberty Modern model also features an automatic levelling system for curb-level boarding, and on-board energy storage systems (OESS) for periods of off-wire operation. Other key features include BROOKVILLE’s service-proven soft-ride trucks, remote diagnostics, and local climate heating ventilation and air conditioning (HVAC) adaptability. Since 2001, BROOKVILLE has been one of the industry’s leading restorers of heritage and president’s conference committee (PCC) streetcars, aiding in the revitalisation and modernisation of classic vehicles in the streets of US cities, including Philadelphia and San Francisco. BROOKVILLE’s range of services includes car-body repair and subcomponent replacement, rewiring, new electrical cabinets, truck restoration and replacements, interior overhauls, and custom refinishing. Key modernisation features include pantograph technology integration, Americans with Disabilities Act (ADA) compliant lifts, LED display boards, and HVAC installations. BROOKVILLE’s original heritage replica streetcars maintain the aesthetics of classic streetcars, while combining the latest innovations in rail transit technology. Key features include BROOKVILLE soft-ride trucks, modern propulsion systems, adapted HVAC for local climate conditions, and LED display boards. BROOKVILLE replica streetcars also include customisable interior arrangements and finishings. BROOKVILLE Eagle Commuter locomotives combine service-proven system technologies and an environmentally friendly power package to provide commuter railroads with an established, modern solution. 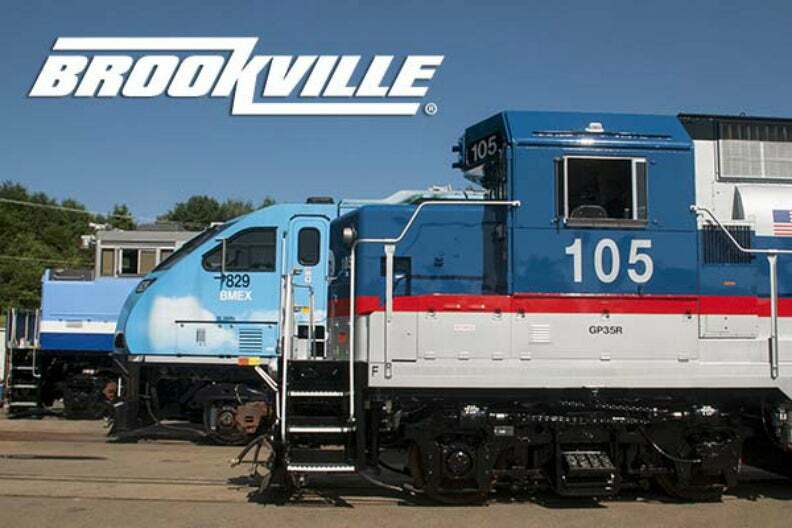 Eagle Commuter locomotives ride on BROOKVILLE-adapted Blomberg trucks, offer added stopping capacity for urban areas through an innovative disc braking system, and feature the latest environmentally driven power packages. Integrated with a state-of-the-art locomotive control system, touchscreen diagnostics, and major component controls, Eagle Commuter locomotives provide operators with a proven engine, designed specifically for commuter applications. BROOKVILLE’s CoGeneration freight locomotives utilise multiple power systems to drastically reduce emissions and conserve fuel for short line and regional freight rail operators. Available in two and three-engine systems, CoGeneration locomotives feature maximum power outputs, ranging from 1,200hp to 2,100hp. CoGeneration genset locomotives also feature control systems to ensure maximum performance, and provide instant touchscreen control of major components, as well as a wide-cab design for easy bi-directional movement. BROOKVILLE single engine freight locomotives provide an environmentally-driven power solution in a classic design package for maintenance and utility tasks on short line, regional, and passenger railroads. The locomotives feature a wide-cab design for easy bi-directional movement, and a state-of-the-art control system to maximise performance, as well as touchscreen control of major components. BROOKVILLE single-engine freight locomotives range from 600hp to 4,000hp, with optional head end power (HEP), providing a passenger service-ready locomotive solution. In addition to original equipment, BROOKVILLE offers a range of restoration, repair, and remanufacturing services to freight and commuter locomotive operators. Everything from locomotive refinishing to complete structural, mechanical, and electrical overhauls, BROOKVILLE provides custom scopes of work to revitalise ageing fleets through end-of-life rebuilds, and the replacement of worn components. BROOKVILLE’s scope of work includes frame repair and component replacement, rewiring, engine and alternator restoration, locomotive control system integration, and cab restoration. BROOKVILLE’s customisable diesel-hydraulic locomotives are an ideal solution for yard and switching applications in need of lower-speed solutions, requiring high-tractive effort. Available in either end-cab or centre-cab designs, these locomotives feature a mechanical drive system, and range from 45t to 120t. Additional upgrades include automatic sliding couplers for tight turning radiuses, and climate-controlled cabs for operator comfort. TEX Rail (Tarrant Express Rail), formerly known as the Southwest-to-Northeast Rail Corridor, is a 37-mile long proposed commuter rail line in the Tarrant County of Texas, US. The Gilbert Road light rail extension project is a 1.9-mile (3.05km) extension of the Gilbert Road light railway in Mesa, Arizona, US. The CityLYNX Gold Line, formerly known as Center City Corridor, is a 10mi (16km) streetcar project in the city of Charlotte, North Carolina, US. The project, which is a key part of the Charlotte's 2030 Transit Plan, is being developed in phases. The Milwaukee Streetcar is a new streetcar line proposed in downtown Milwaukee and the nearby neighbourhoods in Wisconsin, US. The US state of Utah is growing rapidly and so is its population. Inhabitants totalled 2.9 million at the beginning of 2009, and the figure is expected to increase to 3.9 million by 2030.